It’s important to tread lightly with this one. Pregnancy is an intense and delicate time. After all, I can relate; I have two kids under the age of five. Being pregnant involves a balance of caring for your growing baby while trying to care for your own changing body, which at times can seem uncooperative. On the one hand, expecting mothers want to eat well to ensure that their babies are as healthy as possible. But on the other hand, they are often struggling with issues like fatigue and nausea that can make it harder to choose healthy foods. If you can barely keep anything down and you can’t stay awake during the afternoons, thinking about how much sugar you are eating probably isn’t your top priority. For your own well-being as well as your baby’s, it is important to stay relaxed, not be too hard on yourself, and enjoy your pregnancy as much as possible. 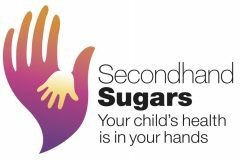 While our Secondhand Sugars mission is to help spread the word about creating a lower sugar environment for kids, beginning in the womb, we do not intend to criticize anyone, let alone pregnant women. We are not advocating a no-sugar diet, but rather a lower sugar diet, and we want to make sure we all know where the sugars are hidden in our foods. What we are suggesting is that when possible, it’s beneficial for mothers-to-be to choose lower sugar foods. Beyond preventing excess weight gain and complications like gestational diabetes for the mother-to-be, a lower sugar diet can also be protective for a developing baby. The sugars that a woman eats in pregnancy can directly affect her baby, creating risk for obesity and other chronic problems. A new study shows that higher sugar and carbohydrate intakes in women during late pregnancy were associated with higher body mass index (BMI) in their children at ages 2-4 years, whereas fat and protein intake were not related to these markers. We do not present this information with the spirit of the “sugar police”. It is instead meant to help expecting moms to take a look at the overall quality of their diets and when possible, to make some positive adjustments. This doesn’t mean that you can’t enjoy dessert or a sweet treat when you want it. The priority is to look at daily food habits, such as choosing water to drink instead of soft drinks, rather than worry about the occasional indulgence. Pregnancy is known for cravings, often for sweets, and sometimes the best thing to do is to satisfy the craving outright. No one needs to feel deprived. But if cravings for sweets become regular and start to tip the balance of a healthy diet, there are likely ways to satisfy them with healthier alternatives. I remember the cravings I had five years ago when I was pregnant with my oldest son and working long hours as a researcher in Los Angeles. One Friday night I was especially tired and nauseous, and my husband told me it was “lady’s choice” for dinner. I suggested the local diner that we had driven by countless times but never tried. He was surprised, yet willing to oblige me and then was shocked when he heard what I ordered: a vanilla milkshake and a grilled cheese. In the 17 years he had known me, I had never wanted a milkshake. What happened to his wife? I enjoyed that milkshake, and with one I was satisfied. I then moved on to finding some healthier alternatives for similar cravings. One of my go-to combinations was cottage cheese with fresh pineapple. Cottage cheese was never something I liked in the past, but suddenly it hit the spot. I haven’t had it since, and I don’t miss it. Pregnancy is funny like that. When I was pregnant with my second son, we were living in Italy, and there I gained some new perspectives on nutrition during pregnancy. Once again I struggled with nausea, and my midwife gave me some advice that I hadn’t received in the States. She said that when I was feeling nauseous, I should stick to cold foods like Caprese salad with fresh mozzarella, steamed or grilled vegetables served cold, water with ice in it, or popsicles (which you can make at home with no added sugar). In contrast, I had been trying hot remedies like ginger tea, as it was winter. Once I started eating more cold foods, I started to feel better. My cravings for things like ice cream (or gelato) may have stemmed from an inherent preference for cold foods combined with an increased need for calcium. Perhaps this is why cottage cheese with fruit did the trick for me. In general, a Mediterranean approach to diet is low in added sugars. A recent study conducted with mother-child pairs, both the USA and in Greece, showed that greater adherence to a Mediterranean diet of the mothers during pregnancy was associated with lower markers of cardiometabolic risk (BMI, waist circumference, and blood pressure) in their children. This provides further evidence that eating well during pregnancy is indeed important for the future health of the child. If you are pregnant and looking to improve the overall quality of your diet by reducing sugar and adding in more nutrient-dense foods, click here for more suggestions. The bottom line is this: be easy on yourself. Sugar is not something to worry about, but to be aware of. Keep in mind that the adverse effects of increased sugars are most worrisome in individuals consuming extreme amounts. Enjoy the occasional sweet treat or dessert when you want it, and meanwhile make positive changes to your overall diet when you can. After all, stress and anxiety aren’t good for you or your baby.